Sometimes, rockstars wear plaid shirts with a comfortable sweater. 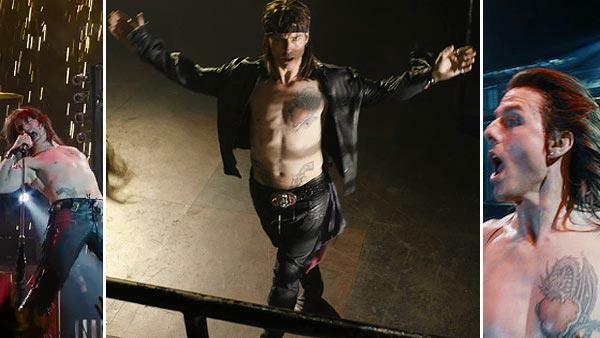 Richard Vaughn doesn’t need to strut around in tight leather pants like Tom Cruise’s Stacee Jaxx in Rock of Ages. He’s badder than that. Much badder. At least to me. When I hear about Type 1 diabetics who have lived well for a long time, my giddyness gets kicked up a notch. More and more of us are passing those age/diabetes milestones we (in the dark of night with the lights off, buried deep under the covers) thought we’d never reach. I’ve met a few T1s with the famed 50 year Joslin Medal, but last week I got to meet my rockstar at the Children With Diabetes Friends for Life. “Have you met Richard?” “Have you seen him?” “Where is he?” “Which session is he in?” These were questions peppered throughout the conference. I snuck in late to a session about social media led by Kerri, Scott, and Jessica Apple of A Sweet Life, and heard him asking a question. “Will someone point out where he’s sitting?” I hissed. When the lively discussion ended, I wended my way up to the front, only to find that he had slipped out the side door. Like a swooning obsessed fan, I ran. Out of the room, down the hallway, until I saw him steadily making his way towards the main meeting area. “Mr. Vaughn!!! Mr. Vaughn!!! !” My laptop bag was bruising my thigh, but I refused to stop and hoist it higher. I didn’t want to miss this opportunity. And then I couldn’t say anything else. I realized that I was in the presence of someone who has been through so much on the diabetes timeline. Despite very little diabetes management help in the beginning of his life, he’s healthy. I want to be him in thirty-sixish years. All I could do was reach out and grasp his hand. He’s charming. Lovely. Gentle. Sweet. Knowing that he was on his way to somewhere else, I let him go. How much I wanted to sit with him and just soak up all he’s teaching us, but alas…. So, thank you, Richard. Thanks for being my rockstar. And for not wearing leather pants. I’m figuring you didn’t because Florida is pretty hot in July. That’s it, right? Great post. I was a bit sad I didn’t catch him at Kerri, Scott and Jessica’s session but very thankful he came in at the end of Dr Bob’s Stress Management session so I at least got to shake his hand and snap of photo. It was great showing my photo to my kids and sharing how Richard lives well with diabetes. My son’s jaw dropped when I told him how long Richard has had diabetes. Then it turned into a huge smile. Christel, you made me laugh….and blush. 🙂 Thanks for your blog. There were so many hugs, and so many pics taken. I am trying to not let it go to my head. lol I am having a knees replaced in Sept, and another next year. I am planning to be at the 2015 FFL. Maybe we can talk then. I loved meeting him… I was so I awe I didn’t know what to say. What an inspiration for all of us! P.S. it was nice meeting you, too! I love Richard now too.